In fact, there’s already progress as the book, which doesn’t exist yet, has an ISBN number, which, apparently, is a good thing for writing a book. I also have a template, have written the title and written the first chapter heading. Yes, I know it’s like being at school and writing the title of the essay at the top of the page and thinking that it’s enough to have a break. Quite frankly it’s not enough and all the time spent on the book is time not spent arranging music for the concert. However, in that department between myself and Jack Junior, we’ve assembled a tentative set list which looks like lots of fun. We’ve also got a few interesting video and audio links which we’re planning to use, and along with a couple of great ideas to add to the showmanship of the whole thing, it’s looking like it really will be a special concert. As far as the research is going, I’m constantly finding out new things. Whilst I obviously want to save things for the book, there’s probably not that much which you couldn’t find out for yourself if you looked as hard as I’ve been looking. However, my previous research led me to believe that Hylton married in 1922, but I’ve dug up the marriage certificate from 1913, which means Hylton and Ennis Parkes were married before Jack went to war. What I haven’t yet found is his war record, though I’ll keep looking! They’re both little details, but vital for a book of this nature. I’ve also finally sorted the siblings facts from the siblings rubbish which has been printed over the years. It appears Jack had just two siblings, a sister who became dance band singer Dolly Elsie, and George, who died in service in World War 1 in France. As I say, this information will hardly save lives, but it’s the detail I need to get started on the early chapters. We’ve also finally got proof that Hylton conducted Glenn Miller’s orchestra in 1943, and amazingly the track and also the pre-tune interview between Hylton and Miller is available for download on Amazon! We didn’t even know it existed. No doubt it’ll be forming part of our upcoming rare Hylton CD release. The plan is to conduct the concert with the baton given to Hylton by Glenn Miller’s band that day. Splendid! So there we go. Not the most riveting blog post you’ll ever need. To try and counterbalance that, the picture at the top of the post is something you’ve almost certainly not seen before. 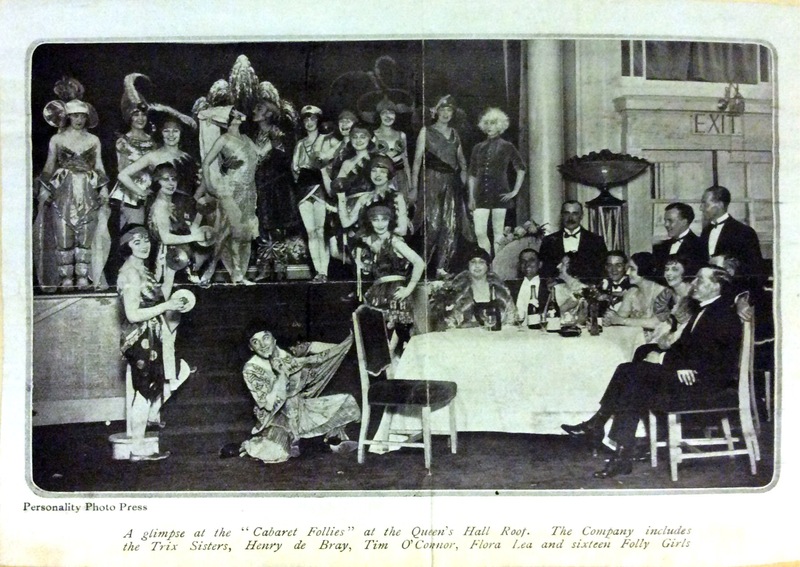 It’s a picture from around 1922 of the Cabaret Follies variety show which Hylton produced at the Queen’s Hall Roof for several years.